The Best Shark Dive in the World! : TEK! As in Traditional Ecological Knowledge! That's what our Eroni and Bay of Plenty Polytechnic undergrad Victor are presently gathering. 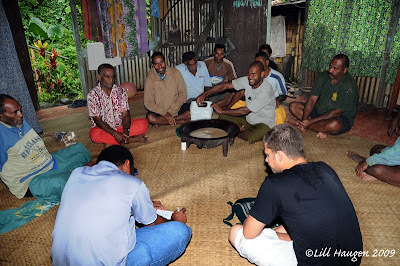 Victor contacted us a while ago asking whether he could join in for some research and we took that as a pretext to initiate phase two of our effort to understand and then, to protect Fiji's Bull Shark population. It's a well known fact that the pregnant Bulls migrate to rivers in order to give birth. In fact, they may even be philopatric and always go back to the same rivers. Rivers and estuaries are ideal Shark nurseries as they harbor many juvenile fishes as prey and also offer some protection against attacks by marine predators, as in big Groupers and other Sharks. It is our aim to identify Fiji's Bull Shark nurseries as we would very much like to succeed in protecting the gravid females on their perilous voyage to and from those locations - and of course, we'd like to protect the youngsters as well. 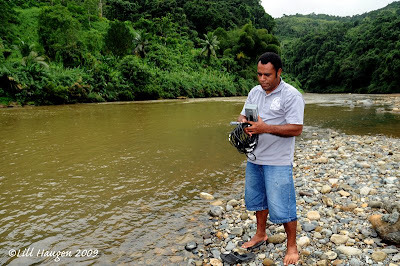 As we speak, Roni and Victor are traveling around the country, conducting interviews with people on those rivers, collecting water samples - and sampling huge quantities of grog in the process! The results so far are nothing short of spectacular as they are discovering a wealth of hitherto untapped traditional and sometimes, even ancestral knowledge about the animals and their behavior. They are also discovering that Fiji's rivers harbor a variety of Sharks and not only Bulls, although the latter are the only ones able to subsist in the upper reaches that are pure fresh water. All very intriguing and exciting - and loads of fun on top of that! Once they come back, we will determine the most promising locations for deploying some of our acoustic receivers - and should we be so lucky to get a ping from one of our tagged females in November, the circle will have been completed. Will this all be enough for Eroni's Masters thesis? Sure it will, amply - and for some new papers by Juerg as well! Delray Beach - Shark Attack?